Kim Jung-Un is on a roll: first he launches a successful-ish rocket and enters the 20th century. Now, Google's top dog is paying his impoverished kingdom a visit to talk Internet in a country where nobody can use it. Uh. It was not immediately clear who Schmidt and Richardson expect to meet in North Korea, a country that does not have diplomatic relations with the United States. North Korea has almost no business with companies in the U.S., which has banned the import of North Korean-made goods. North Korea is dirt poor—most can't afford a computer. There's zero broadband availability unless you happen to be the dictator's chum. Some citizens haven't even heard of the Internet before. 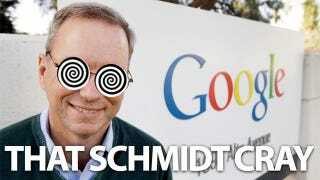 But if Schmidt could manage to crack open the country as a fresh market, Google would have over 24 million potential new customers. Still, the odds of that are low: North Korea's humanitarian record makes China look like Finland, and freedom of thought, let alone freedom of speech, are virtually non-existant. YouTube on North Korean screens is unimaginable under the current regime.